Access control in Recogidas street, restricting the access to the town Center. According to Access Control Municipal Regulatory Ordinance in Granada, there is an access control in Recogidas street (Puerta Real sense of circulation). 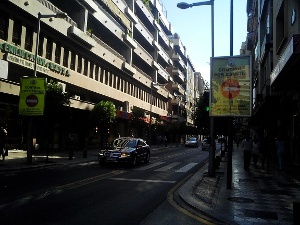 After Solarillo de Gracia and Doctor Martín Lagos intersection. This control point is indicated before the beginning of the street (roundabout in Neptuno street and Camino de Ronda) Access through Recogidas street is allowed from Camino de Ronda to Dr. Martín Lagos street. From number 1 to 29. From number 2 to 24. From number 1 to 25. From number 2 to 16. From number 2 to 42. Numbers 3, 4 and 5. Padre Alcover street. From number 1 to 15. From number 2 to 12. If you are going to get to the hotel through Recogidas street, you can give your number plate once you are in the hotel.